Posted 7/30/2013 9:28pm by Andrea Tomlinson. 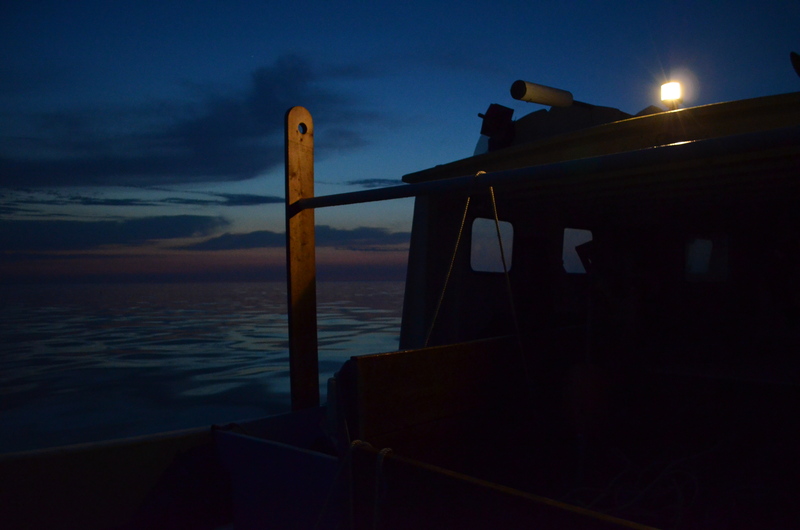 So we are wrapping up the last week of our first season of our newly founded community supported fishery. Thank you all for a great season! We couldn't have done it without all of you. 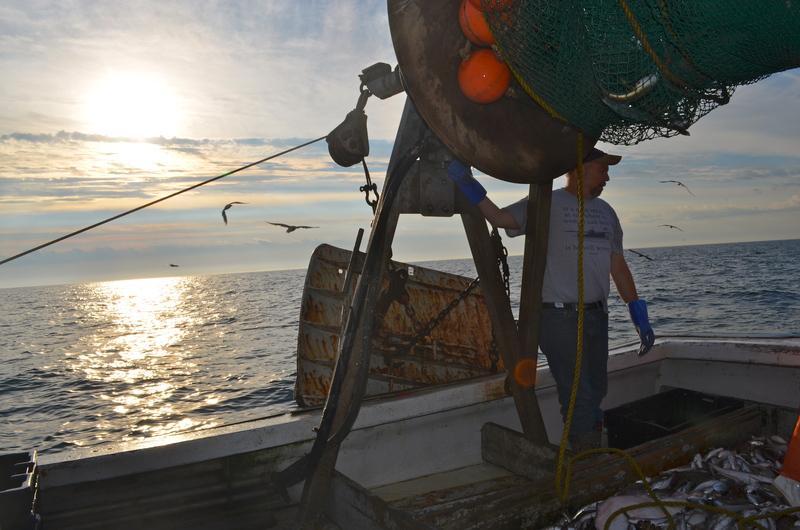 Still to pick up this week is Portsmouth, Manchester, Durham and Tilton CSF groundfish members. Fish this week will be an assortment of favorites from this past season and will be available on a first-come first-serve basis. We plan on having Pollock, Cod, Monkfish, Cusk, White Hake and possibly King Whiting available, each in limited supply, so come on the earlier side to guarantee your favorite. We also plan to have some extra made available at each of the pick-up if you're looking to take home additional fish. If you are looking to continue on with us into Season 2 please make sure to re-enroll on our website here, or let me know when picking up your fish this week, and I can do it for you. The deadline for joing us for the start of Season 2 is this Friday, August 2nd. You can either pay online, mail us a check, or pay cash, check, or credit at your first pick-up. We'd love to have you join us again for another 8 weeks of the freshest fish. As a reminder, if you belong to the Tilton CSF your first season does not come to a close until August 23rd, so you can disregard all the sign up notices. Also, last week was the last week for underdog CSF members. Hope you enjoyed your Cusk. In other news, Josh has returned from Washington, D.C. where he was invited to speak on behalf of the NH fishing industry. 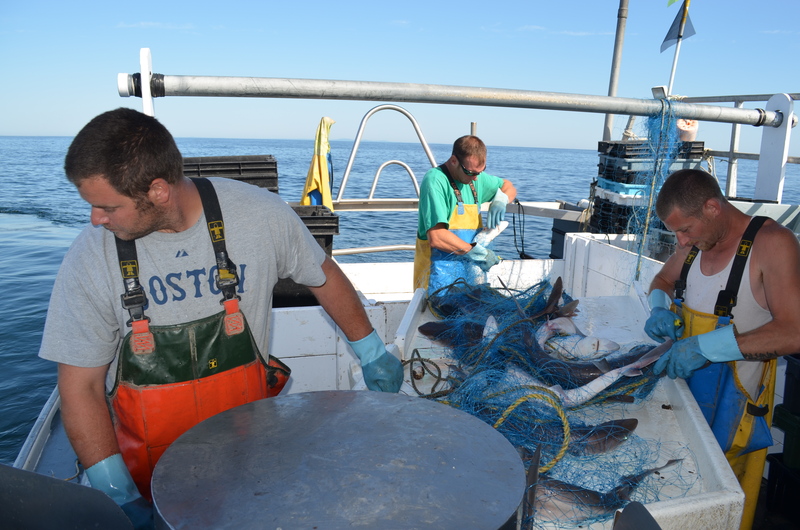 NH Senator Ayotte supports our New Hampshire fishermen. Read more about Josh's time in the Union Leader here. As it turns out, US Senators are curious to learn more about our CSF and many of them are itching to try our NH Dayboat Dogfish. Pretty exciting!!! Looking towards Season 2, we've finally decided on a lobster share. If that is something you are interested in, sign-ups are available on our page now. It's looking like it's going to be a bi-weekly share of 4 lbs. for a full share or 2 lbs. for a half share of live lobster every other pick-up. We have Taylor Lobster of Kittery, Maine and local lobsterman Damon Frampton to thank for this new share option. If you have already registered online and would like to add this option to your share, please feel free to contact me and I can help edit your account. We also finally have been able to track down some more raviolis for our CSF members and are now in possession of 5 cases. Hopefully these will last us all through the week. They will be available at each pick-up, 14 dollars a bag. I believe each bag is around 12 ounces. Sorry it took me so long to acquire more. Thanks for your patience. We have also decided to include a Peterborough pick-up for Season 2. If this is something you'd be interested feel free to enroll online or give us a shout. Also, please share this information with any of your friends who live in the area and would like to participate. We do not have all the logistics of the pick-up worked out just yet, but are hoping to have more information available soon. It may involve rotating CSF members volunteering to pick-up everyone's shares for distribution back in Peterborough in exchange for free fish. Thanks to all those who have been persistant in demanding fresh fish further inland. 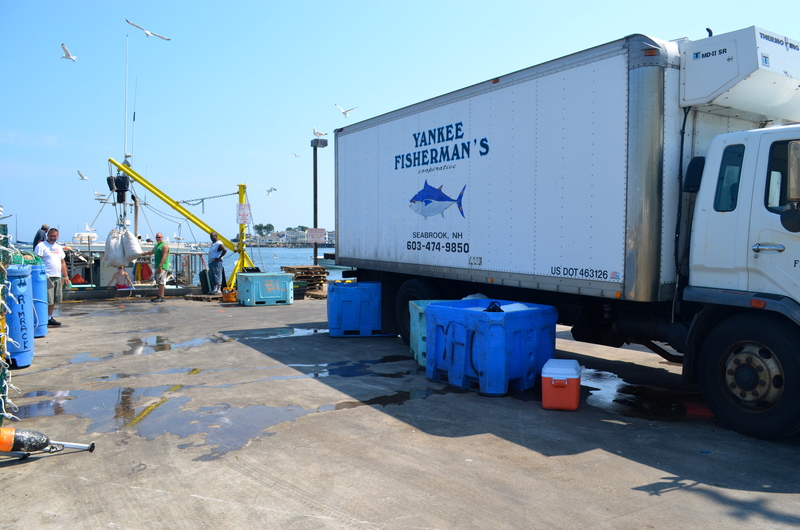 If you are unable to join us for Season 2, but are looking to still pick-up fresh fish and lobster from time to time, feel free to contact us, be in touch, or visit us at one of our market pick-ups. We do our best to bring along some extra fish from time to time. And either way we'd love it if you'd stop by and say Hello. Now that we have Season 1 under our belt we are hoping we can more easily elaborate on our current model that we have set in place, offering you, our members, more. Things to look forward to: Additional NHCS merchandise (t-shirts, hats, notecards), Value-Added products (raviolis, NHCS-made fish cakes and fry mixes), CSF Fish Frys, How-To work shops ("Dealing with whole fish"), etc. We are continually brainstorming and looking into new ideas. We'd love to hear what you would like to see for Season 2. We're hoping only to improve our CSF here on out. I guess that's all for this final Season 1 newsletter. It's been a great first season! And don't forget to join us for SEASON 2! Posted 7/23/2013 5:23pm by Andrea Tomlinson. Pollock for groundfish members and cusk for underdog members this week! They are both white, flakey, mild fish and easy to work with. When looking for recipes any white fish recipe should do. For those of you unfamiliar with cusk it's a member of the Cod family, just a bit smaller of a fish typically. 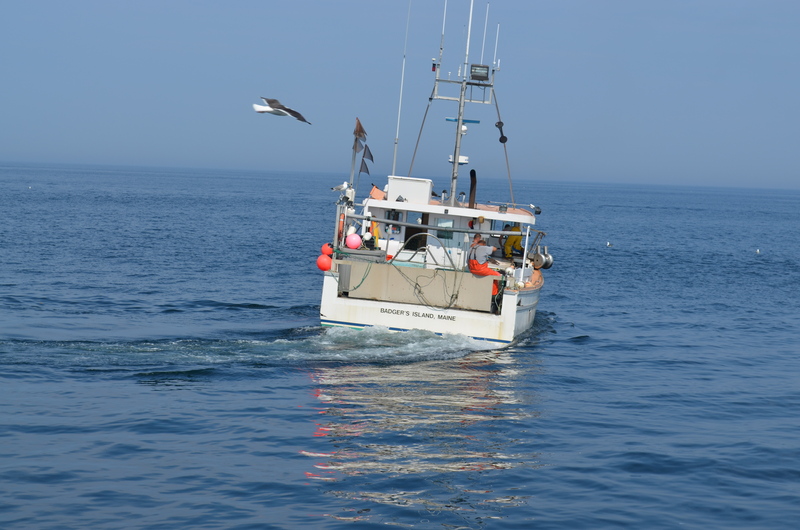 Our Fishermen of the Week this week is Jay Driscoll, FV Sweet Misery of Rye Harbor. You can read about him here. Big news! 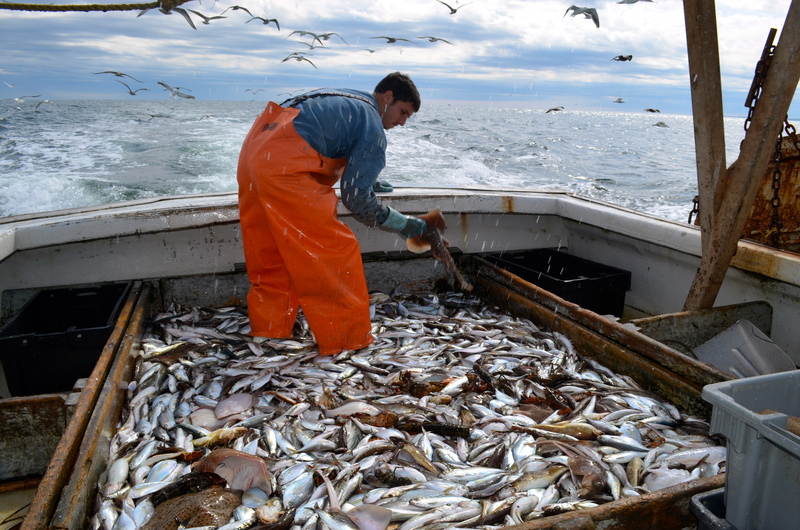 As I write to you today, NHCS' Co-Founder and Executive Director, Josh Wiersma is testifying on the state of our NH fisheries in Washington DC to the US Senate. They have also personally asked him to discuss the evolution of NH Community Seafood. Thanks to all of you, we are making US history today. Thanks for being a part of it. His wife, Jonida, is also in DC with him and she has been sending me updates thorughout the day. The latest news, we have some senators who are looking to order Dogfish Shark next time they are in NH. Change will come, but for now it's one step at a time. Look for Josh on CSPAN sometime today. I'll be cheering him on. We have one more week remaining of Season 1 and then we'll be moving right into Season 2 which is to start Monday, August 5th. Registration is now aviable for that on our website. We'd love it if you could re-enroll as soon as possible to help save Josh and I some stress. Currently there are only 50 people enrolled, and we're really hoping to see an increase in numbers this next season. Registration for the start of the season will come to a close on Friday, August 2nd, after that we will be accepting additional members on a prorated basis for the first 4 weeks of the season. Also if we could all encourage one other person to enroll in Season 2, that would be a great help. We'd love to meet our goal of 400 members by the end of summer. Thanks for your help with this. - Tuesday's Rye Harbor pick-up will be changing to the Greenland Farmers' Market at the Greenland commons. Pick-up there will be on Tuesdays from 3-6. Sorry for any inconvenience this may cause for our current Rye members who are looking to re-enroll. We're hoping with the new location we'll gain more exposure due to the increase in foot traffic. - The time for the Friday Durham pick-up will be changing slightly. It will run from 11:00-1:30 instead of going to 2:00 in order to help us get to the Tilton Farmers' Market on time. Also we may need to relocate to another Durham location half way through the season due to the start of the Fall UNH Semester. Please feel free to contact us with any suggestions. - Despite what I had said in last week's newsletter, we will indeed be offering a Whole Fish share. As it turns out our CSF members really love their whole fish which was great to hear, so we decided to include it again this season. Thanks to those of you who spoke up. We're glad you're enjoying it. - Our Underdog share will become a weekly share rather than bi-weekly and we will be offering full, half, and quarter shares. We've also decided to include Dayboat Dogfish in both our groundfish and underdog share due to such a high demand for it from our CSF members. It's great to see it's been receiving such positive feedback. 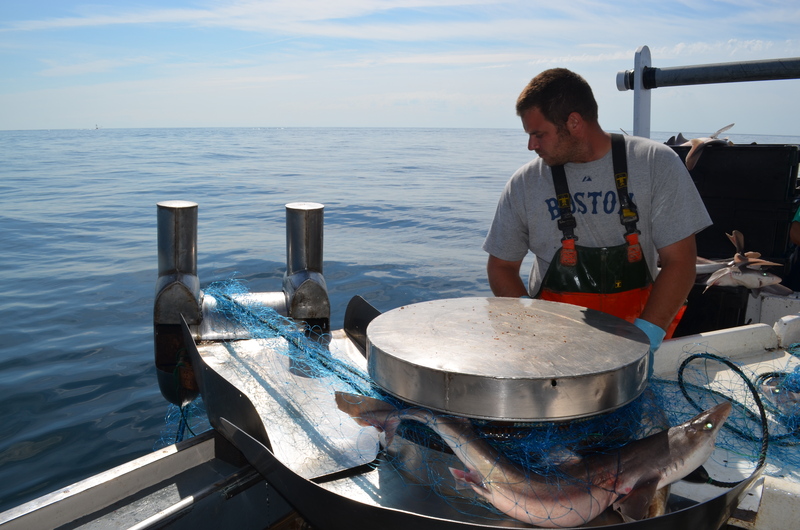 We really hope to see a market develop here in New England for dogfish throughout the next couple of years. I think it's going to be really important this happens in order for our fishermen to sustain their livelihoods. Help spread the word. Dogfish is delcious. Thanks to all of your for being supportive, and experimenting with these new species previously unknown to many of you. We believe that to be a huge component of participating in our CSF. - Just as a reminder, our Tilton members are on a different time schedule than the rest of our CSF members since they started later in the season at the start of market. So I will be in touch with you guys about where you are in the season. Also we'd love to boost our Tilton membership to help us justify continuing to drive all the way there. Let me know if you have any suggestions about how we could do that. - Also for those of you who have bought stock in NHCS, have no fear, we have not forgotten about our member-owners. We plan on mailing out information packets and stock certficates very soon. Make sure to look for those in the mail. Thank you for your continued support. And as a side note, when going to register for Season 2, if you've already bought one set of stock please refrain from purchasing another set of stock. Our cooperative's bylaws state that each member is allowed one set of stock a year. I'm not sure that's specified just yet on our website. I will have to look into it. Thanks for your understanding. - I still have yet to figure out what our lobster share is going to look like, but I am continuing to pluck away at that. I promise I will send out an email as soon as something becomes available. Also, I'm still waiting on another batch of lobster ravioilis. Sorry to sell out so quickly last time. I don't think Portsmouth Lobster Company was expecting us to go through them so quiickly. As it turns out, NHCS members love their Lobster Raviolis. - Our new van is treating us famously. We're hoping to have the logo painted on it tomorrow, which will make us even easier to spot. Can't wait to see how that turns out. We also should be receiving our custom FISHUES license plates soon. I couldn't help myself; I tell you, it's the little things in life sometimes. - If you have a Facebook and have yet to find us, I encourage you find your way over there when visiting cyber-world one day this week. I try to keep the page updated as best I can with day to day going-ons. I think that may be it for news and changes in our next season. As we approach season 2, please don't be afraid to speak up; we'd love to hear from you about any changes or improvements you'd like to see. Afterall this is as much your cooperative as it is ours. Speaking on behalf of Josh and I, we have a never ending list of things we'd love to improve, add, and elaborate on. It's in our best intentions to continually improve upon this CSF. Any additional input from our members would be appreciated greatly. See you all next week for our last week of Season 1. And we hope to have you again for Season 2. Don't forget to sign up today and tell a friend! Posted 7/22/2013 12:06pm by Sarah VanHorn. “I love it out here. 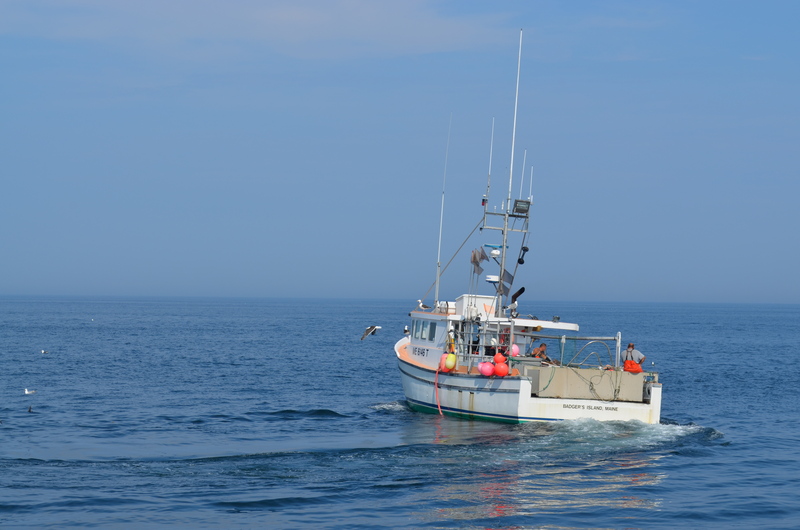 I’m too young to sit back and not fish,” says Captain Jay Driscoll when asked why he gillnet fishes 7 days a week just off the shore of the New Hampshire coast. With a crew of 3, the ’89 Canadian-made Novi, Sweet Misery, sets out to open water every dawn around 4 am recovering their sinking nets set just 24 hours prior. With the summer comes dogfish season, a time when a good day is described by hauling in a couple thousand pounds of dogfish shark most commonly shipped to England, and a couple hundred pounds of cod to be distributed around New England via the Yankee Fishermen Cooperative in Seabrook, among other miscellaneous sea creatures: spider crab, Pollock, lobster, redfish, whiting, grey sole. When asked what dogfish tastes like he proclaims, “I don’t know; I’ve never had it, but I would love to see it used around here. It’s always just shipped straight to England for fish and chips.” By mid-August they shift to fishing for Pollock and cod, and then to just Pollock a few months after. But it's not all hard work aboard Sweet Misery; with Jay as captain, he finds time to lighten the mood. Whether it's the crew's traditional Gangster Monday where they pick through fish wearing backwards hats and thick gold chains jamming out to gangster beats, or it's Jay playing pranks on sleeping deckhands on the way to their fishing grounds. There's always time for a laugh aboard Sweet Misery. Growing up in the area as the son of a marina boat mechanic, Jay began fishing with his uncles 22 years ago and has yet to stop. He continues to fish the same 30 square miles he’s been fishing since he started. When asked about his responsibility as President of the NH fishing sectors, he responds that it’s his job to keep the fishermen on the water doing what they love. When Jay’s not fishing he enjoys fixing things that are broken, scuba diving, and animals, including his two dogs Melvin and Frank, as well as offering his spare time to helping out the local animal shelter. Having dove in many spots around the world, he claims Duck Island, Isle of Shoals is still one of his favorite spots to dive. Posted 7/16/2013 11:31am by Andrea Tomlinson. Greetings Members of New Hampshire Community Seafood. Normally, Sarah does most of the communication and outreach to you and I stay in the back managing our New Hampshire Fishing Industry and making sure we have enough fish to catch for you all each week. But I wanted to take a moment to reach out to you all and formally thank you being part of our CSF and our fishing community. I've been fortunate to be able to attend most of the drop offs to this point and I'm sure I've talked to many of you about the New Hampshire Fishing Industry and why your support is so important. For those of you who I haven't had the pleasure of meeting yet, allow me to re-introduce myself. I'm Josh. Not only do I help run the CSF, but I also manage the two New Hampshire Fishing Organizations responsible for catching your fish. I make sure our boats fish underneath their allotted amounts, I buy and sell fishing rights (catch quota) on their behalf, and I the enforce rules and fishing regulations to make sure that collectively we are fishing sustainably but also at maximum yield. This year was the most difficult year since I started managing. To start the year, the federal government severely limited our allocation of Gulf of Maine Cod by 78% from last year. 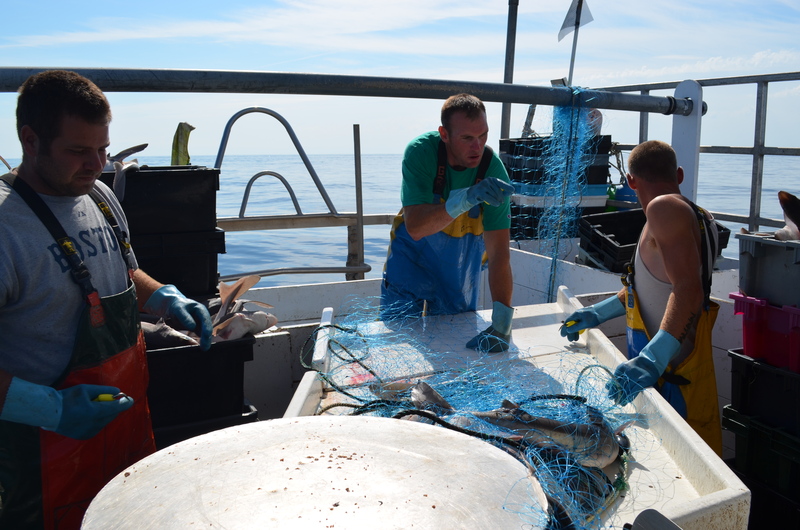 In New Hampshire, Cod is king and has been the driver of our fishery for years. 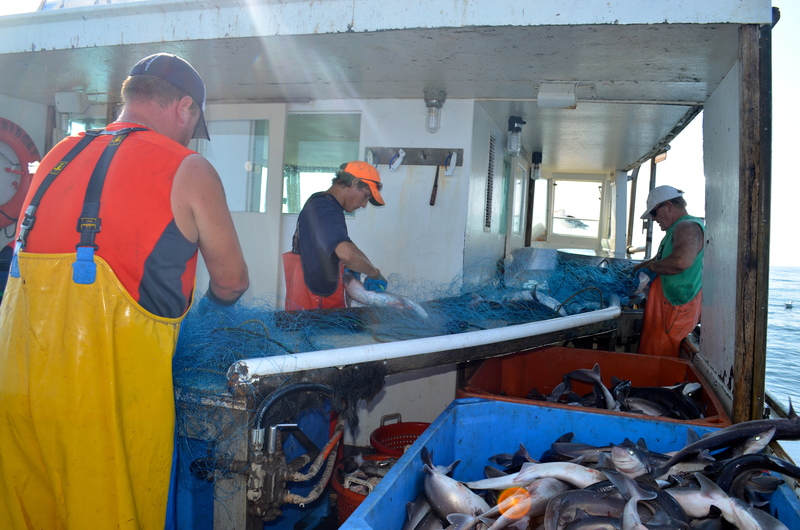 Fishermen had to figure out how to still go fishing without focusing on Gulf of Maine Cod, a task that forced 50% of our fishermen to stop fishing completely this year. The twelve boats that continue to fish are struggling to make enough money landing other species. One stock that is completely healthy, delicious, certified Marine Stewardship Sustainable is dogfish. As many of you know, we catch a lot of dogfish here in New Hampshire, but the market is all over seas for now--mostly in Britain for their "Fish and Chips". The global prices are also getting lower and lower. We wanted to change that. Not only did we want you to experience our delicious dogfish, but we wanted to offer you a product unavailable anywhere in the world right now--"day boat" dogfish which is cut, gutted, headed, bled, and then iced at sea for a dramatically different and superior product. Last season, we offered our "day boat" dogfish with an assortment of recipes to our Underdog Members and we received enough positive feedback that we decided every one should try it. Not only will you be able to eat a delicious local product unique to this State, but you will also be greatly benefiting our shrinking New Hampshire commercial fleet as we are able to give them a much better price for their "day boat" dogfish than they get on the global market. Please join us next season to continue to get the freshest and best tasting seafood available, and to continue to support our local fishermen, who could probably use it now as much as ever. Thank you again for making this a successful fist 8 weeks. We intend to send around a short questionnaire for you to fill out to provide us some feedback about what worked and what didn't work the first season, what things you'd like to see different. etc. We also hope to reach 500 members at some point this year. We are currently at about 275, so if you like us, please tell one other person about us. We hope to keep growing and spreading our community by word of mouth. Posted 7/15/2013 12:45pm by Sarah VanHorn. Good afternoon CSF members! We are entering our 6th week of season 1. 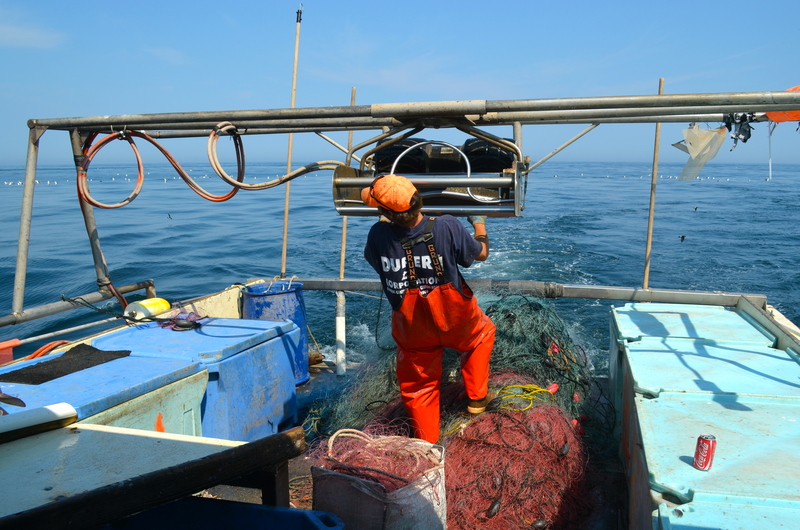 This week groundfish members will be picking up either Pollock or White Hake based on their availability. Both fish are mild-tasting, white, flaky fish and are easy to work with; any white fish recipe should do. 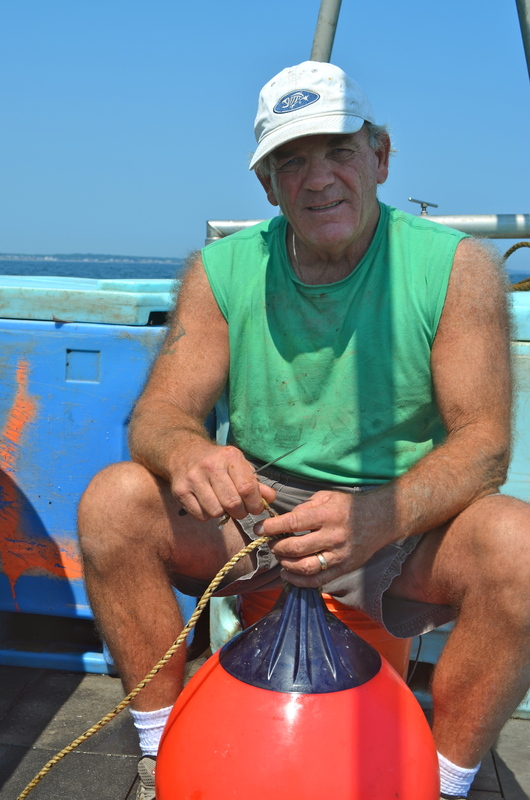 Our fishermen of the week this week is stern dragger, David Goethel of Hampton Harbor. You can read a blog I wrote about him last summer here. In other news, we officially have our refridgerated van which has simplified both our lives greatly. I'm hoping this will enable us to be more punctual and organized. That in mind take note we will now be driving a white van rather than Josh's blue Tacoma. Also, we are having it painted with our logo this coming Saturday which will make it much easier to spot. We're feeling more official each and every day. Also this week, we will have Damon Frampton's Terra Cotta Pasta Lobster Raviolis available for $14 a bag. They will be available at pick-up on a first-come first-serve basis. We can accept cash, credit, or check for those at pick-ups. There's also a slight possibility that we will be teaming up with a local harvesting company in the area to offer our members little neck clams each week at pick-up. We will be sure to share more information about that as it becomes available. Season 2 is fast approaching! Our next season will run 8 weeks from August 5th to September 27th. We have opened sign-ups for Season 2 as of this morning. The deadline to join for the start of Season 2 will be Friday, August 2nd. We will be accepting both returning members, as well as new. We'd love for you to share information about our CSF with your friends. We currently have plenty of room for additional members. Also, please remember if you are unable to pick-up one week due to a leave of absence from the seacoast or otherwise, that all CSF members have the ability to put their fish on hold for that week, and may later double up their share or extend their season by 1 week. Rolling enrollment will also be available at a prorated cost for the first 4 weeks of sign ups. Some changes to note from Season 1 to Season 2. Our underdog share will no longer be offered as a bi-weekly share, but rather a weekly share with Full (2 lbs. ), Half (1 lb. ), and Quarter (1/2 lb.) shares as options. It has been to difficult trying to manage bi-weekly members. Also, due to a lack of interest, we have removed whole fish shares from our option menu all together. Sorry for those of you who have been enjoying that option in season 1. We are also continuing to work on some sort of lobster share. We will be sure to let you all know more about that as soon as we have some more details worked out. We are also looking into printing some NH Community Seafood t-shirts and have since added it as a menu option to help us gauge interest so we don't end up printing too many. We are planning to have them printed locally on a high quality cotton. Most likely they will be a solid color with the logo on the front. 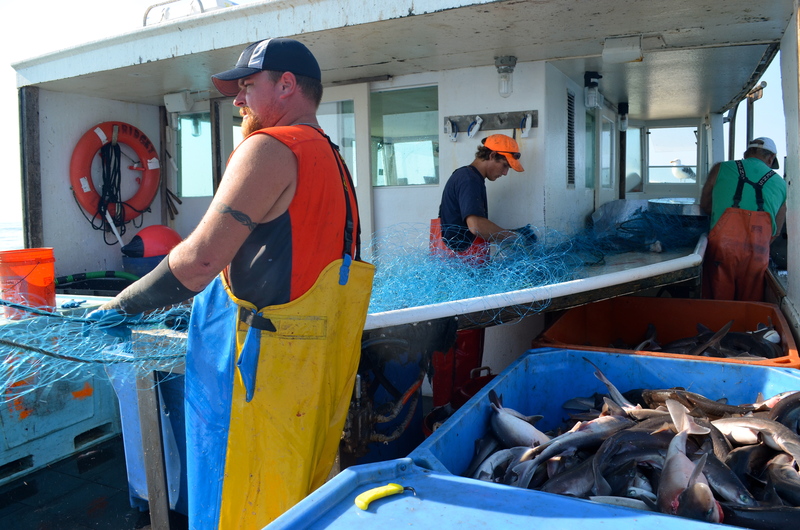 On another note, there have been some drastic changes within our local fishing industry the past few weeks regarding the market for dogfish shark and many of our fishermen's livelihoods have been put on the line. It is likely that we will be losing a good portion of our local fishing fleet in the weeks to come. It is a scary time for both our guys and our new cooperative. We hope we are able to sustain our community supported fishery despite the drastic decrease in fishermen expected to be fishing in the weeks to come. 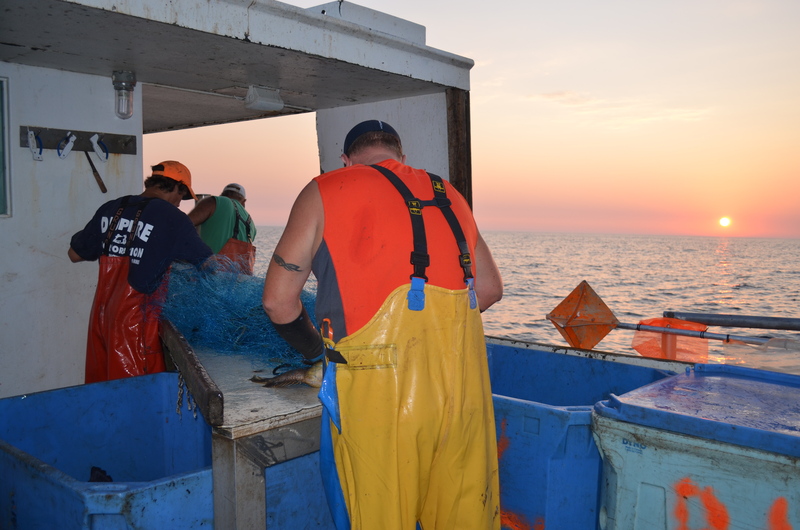 Here at NH Community Seafood, we want our CSF members to be in the know and we want all our NHCS members to know that things are not looking good for our local fleet, but that we have no intent of giving up, and we are doing our best to sustain our new cooperative. 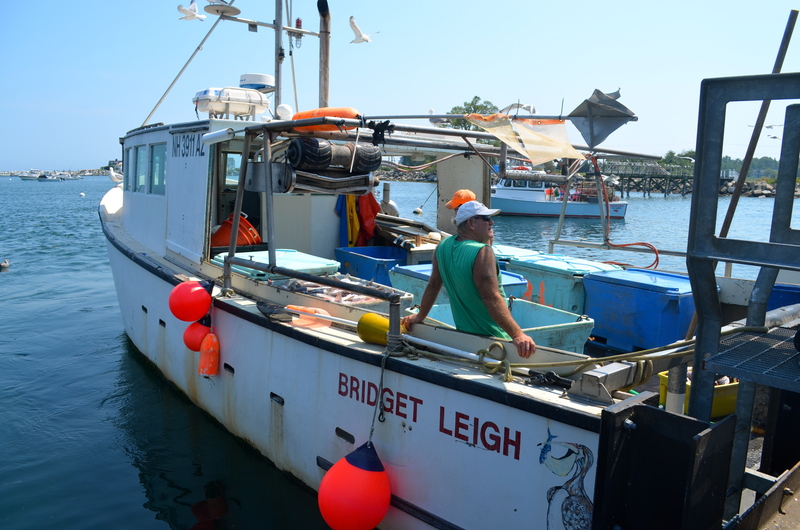 We each must all step up and take control of our local food system and support our seacoast fishermen at a time when it is needed most. 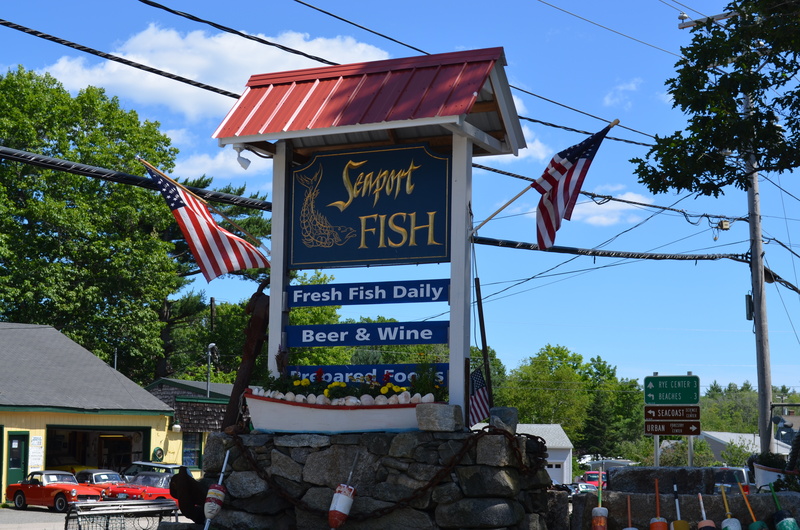 NH Community Seafood needs your support now more than ever. 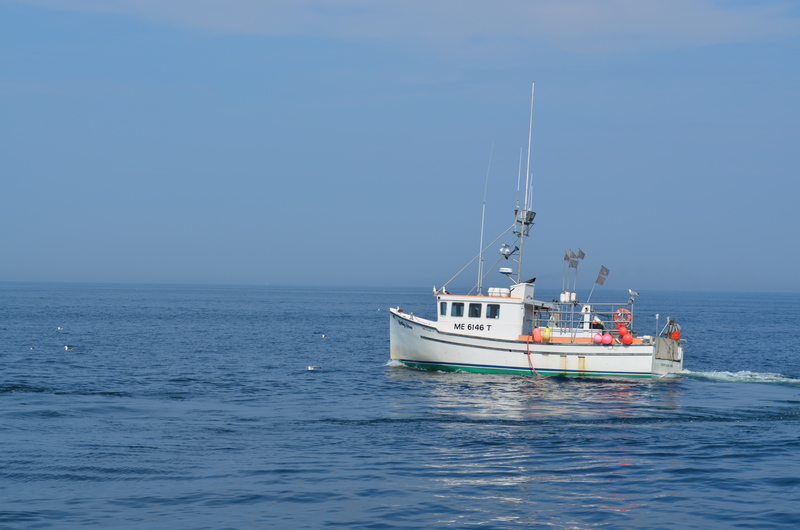 You can look for a newsletter from my partner Josh, the Sector Manager of the NH fishing fleet, in the next couple of days with more information about the crisis at hand. Please stay tuned for that. I'm sorry to be the bearer of bad news, but please let us not lose sight of all the good that is happening within our community. This week we have 277 members eating locally caught fish! That means we have over 500 pounds of locally caught fish filets staying in state rather than being exported to the global market. That is a huge feat in it of itself and it is thanks to all of you, our CSF members. May our NH fishermen rally and their livelihoods be sustained. Posted 7/15/2013 9:55am by Sarah VanHorn. "Both my sons have fished with me at one point or another. And I'll tell you, nothing clarifies the mind like picking small fish for the day, 10 miles offshore," shares David in reference to his two sons' decision to pursue a college education rather than entering into the fishing indsutry. "I do it because I love it, but it’s not for everyone." 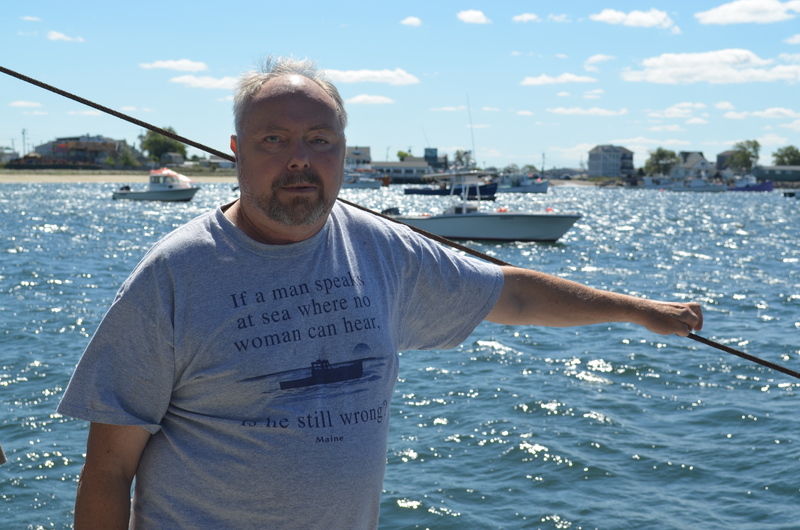 David Goethel, who was born in Boston and raised in Needham, Massachusetts, has been working on the water since 1967, starting out as crew for party boats, which he would fish off of when he got the chance. He later went to Boston University where he received a degree in biology with a focus on marine sciences. David continued to work on boats throughout his time at school and later received his US Marine Officer license which led to him receiving his captains license later on. In the winter of '76 David worked part-time at the New England Aquarium where he met his wife, Ellen. Though he was offered a full-time position in the Spring he decided to return to the party boat business, because he had felt too disconnected from the day's natural rhythms working indoors. David later moved north to New Hampshire and was soon able to pay off his college loans in their entirety working on the water. In 1982 David Gothel had his 44 foot stern dragger built, Ellen Diane, by the John Williams Boat Company in Hall Quarry, Mount Desert, Maine. 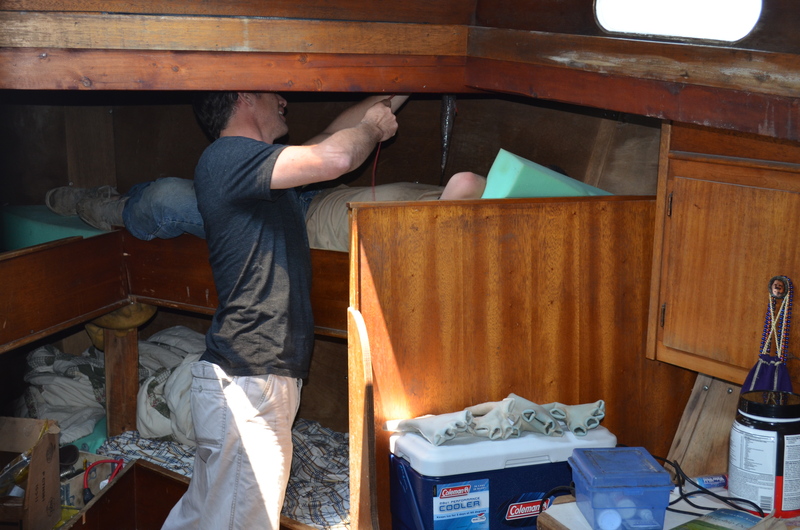 "There's only ever been one captain of this boat, and that's me," points out David proudly, drawing my attention to the delicate wood work throughout the cabin. 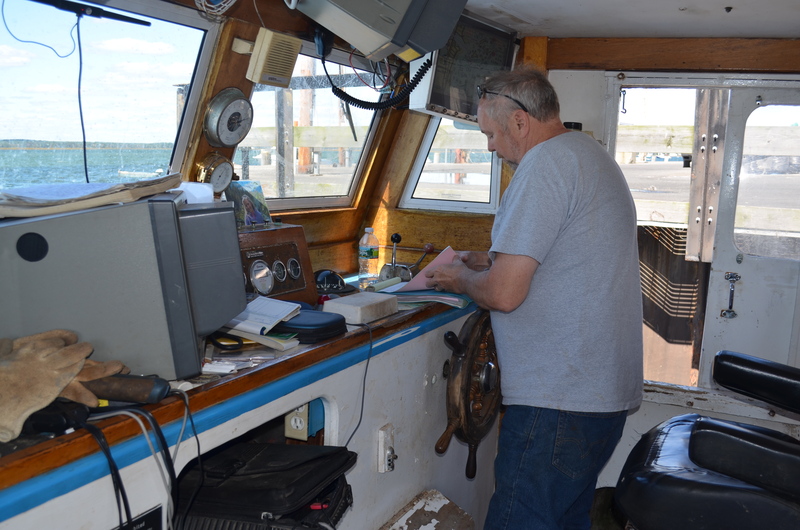 Never having operated his own fishing vessel before, he considered the time a great opportunity to enter the industry. "Back then I had the luxury of being able to learn to become a fishermen, there were no regulations and you could fish as often as you wanted." For that reason, he was able to pay off his custom boat in 3 years. Today David fishes 7 days a week. "If the fishery is open, I'm going," he exclaims. David tows 3-4 times a day for an hour and a half at a time about 8 miles offshore targeting silver hake, also known as whiting. 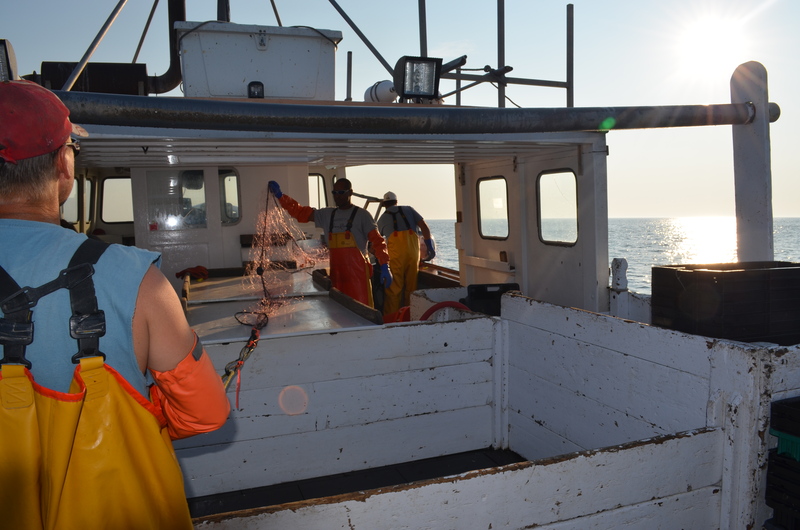 According to David the first tow of the day is always the best due to the vertical diurnal migration of silver hake, meaning they feed at night just above the bottom, but at the first sight of day they begin to migrate back to the ocean floor, at which time the trawl is most likely to sweep them up. There have been various studies conducted on this unique behavior such as the one from the Canadian Journal of Fisheries and Aquatic Sciences that can be read here. On an average summer day, David hopes to haul in 3,000 pounds, but there have been days where he's caught as much as 7,000 pounds and as little as 500 pounds. 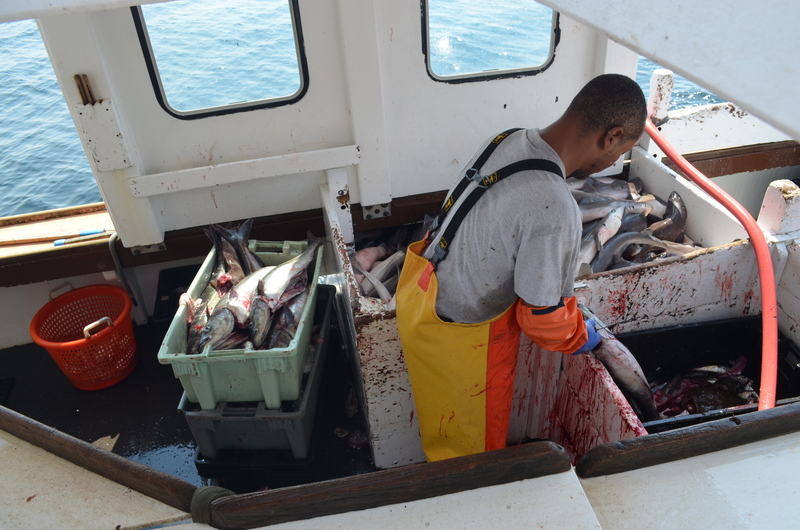 Today he hopes the price of silver hake to be between $0.60-$0.80 a pound, but that's not always the case, at times it has been significantly less. 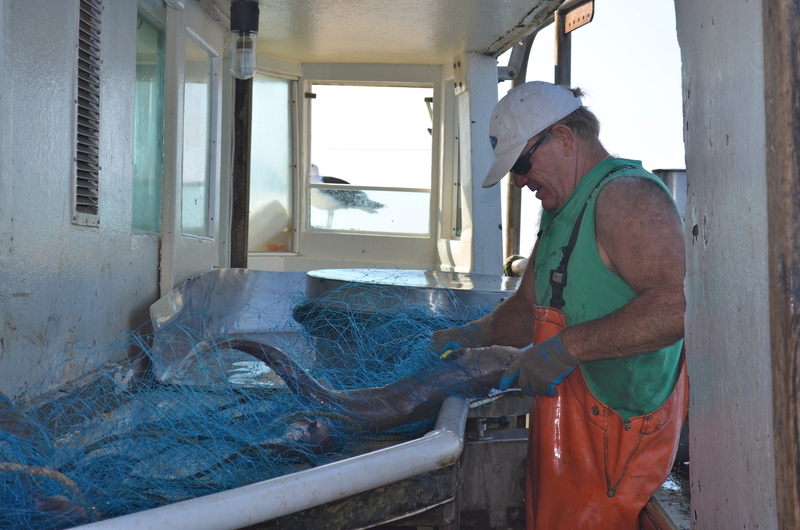 Though David is a member of the Yankee Fishermen's Cooperative, his hake is typically shipped straight to the cities where it is then sold around the world since there's little to no market for them around here. "They taste a lot like haddock or cod," he says. "They're really good, just under-appreciated." 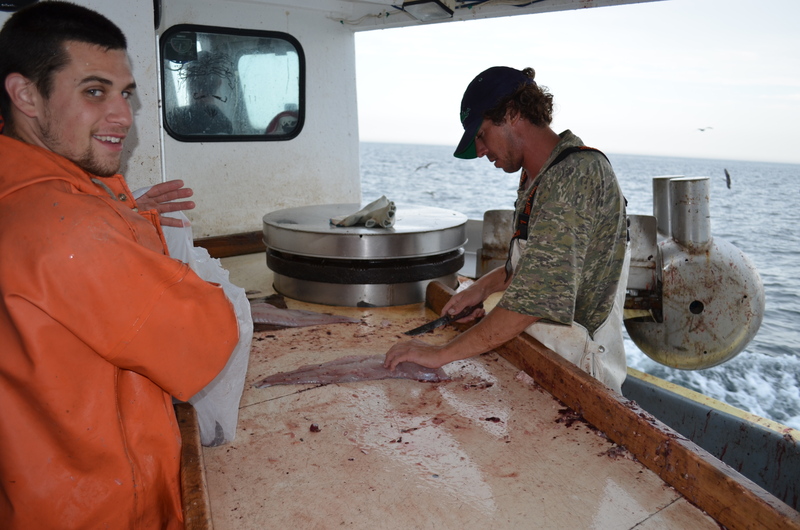 David also fishes for tuna, cod and flounder at different times throughout the year. 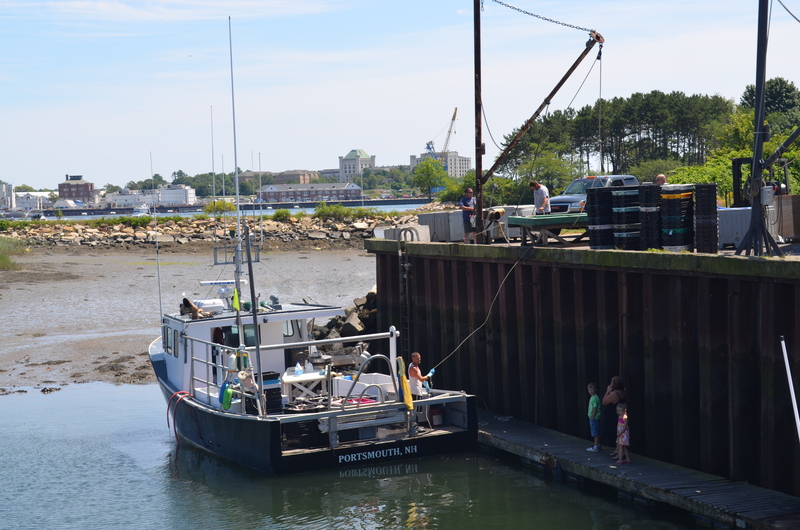 "That's why there's always been a fishing fleet in New Hampshire," he shares, "there's fish to catch year-round." David takes pride in the knowledge he has gained as a fishermen and a naturalist over the years. 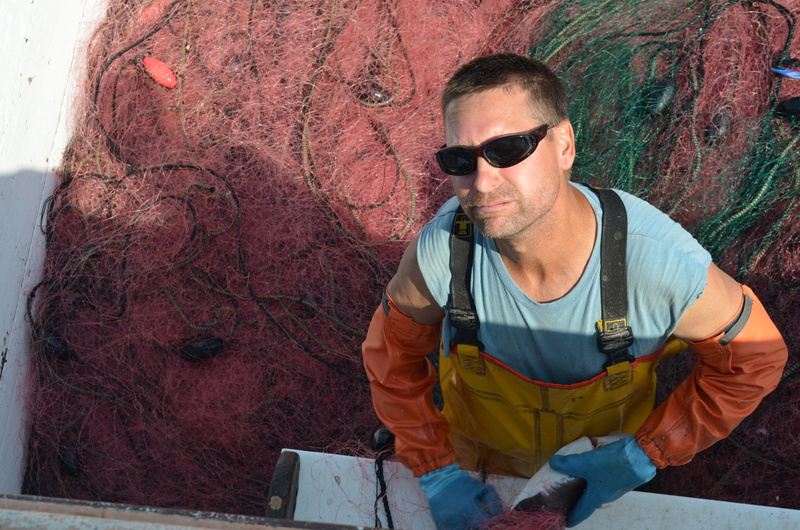 "People don’t know anything about the ocean bottom until you try to drag a net across it,” he claims. 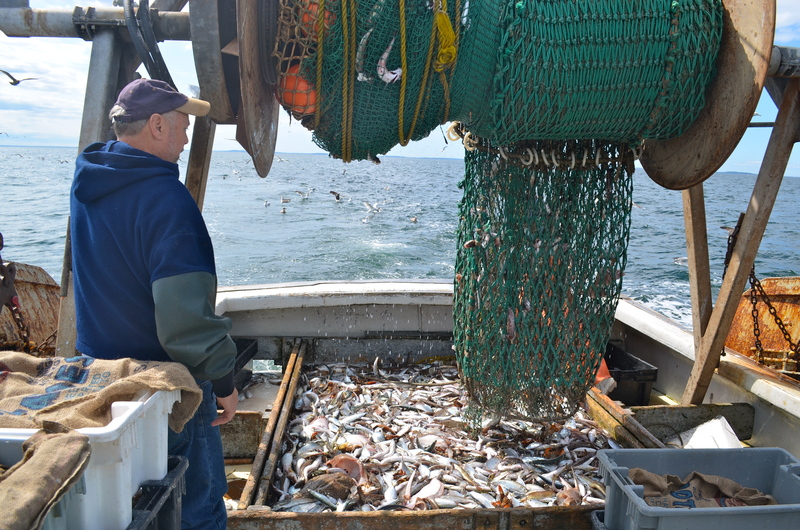 Scattered amongst the whiting within David's haul, there are also butter fish, mud hake, flounder, lobster, skate, squid. 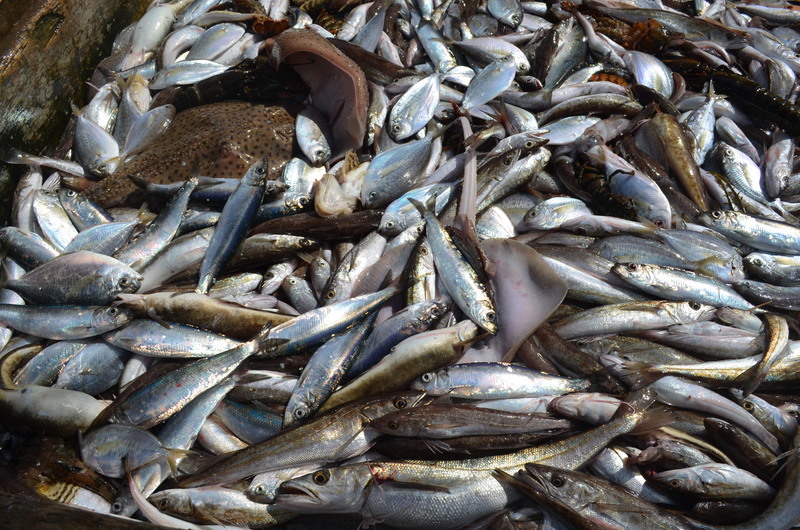 Many of them are thrown over as bycatch and others are thrown in boxes to be sold as bait. "These fish we’re selling as baitfish are great tasting fish," he says picking them up to show me. "It’s just that nobody wants them around here. If I think back, the things that are delicacies now...I used to throw those things over every day years ago: scallops, monkfish, lobster. It wasn't until chefs like Julia Child came along and changed all that." Like David, his wife Ellen is a strong believer in the power of education. A graduate of Northeastern University with a degree in biology, Ellen has since started her own traveling education program called Explore the Ocean World Now. With the help of David, Ellen collects different organisms which she cares for in large aquariums set up in their garage. Ellen takes these creatures to elementary schools throughout New Hampshire educating children about the ocean, sharing with them live organisms they may never have had the opportunity to experience otherwise. Ellen visits about 80 different schools a year. 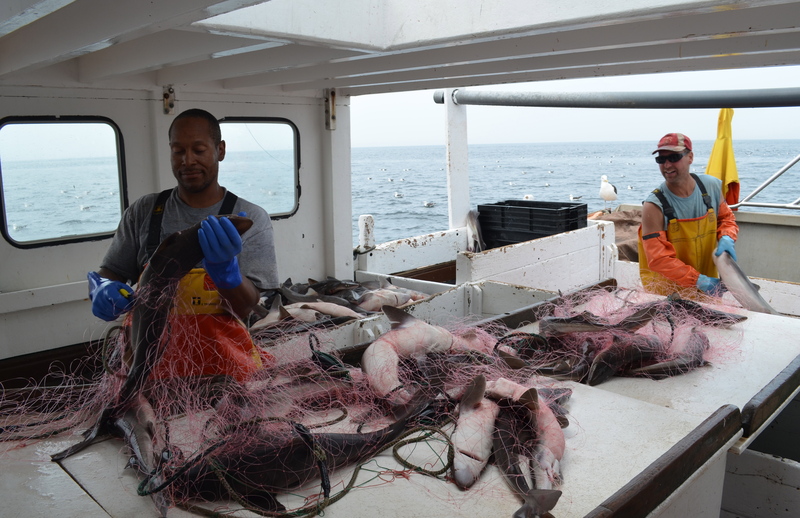 Throwing over bycatch: skate, flounder, lobster, etc. David is known to be a passionate member of the local fishing community, placing great faith in the collaboration between scientists and fishermen, and has partnered with scientists and organizations on various occasions, conducting research on his boat throughout the work day. An example of this being the tagging of yellowtail flounder, a program he initiated with his youngest son, Daniel, who has been working summers on the boat with his father since he was 14. 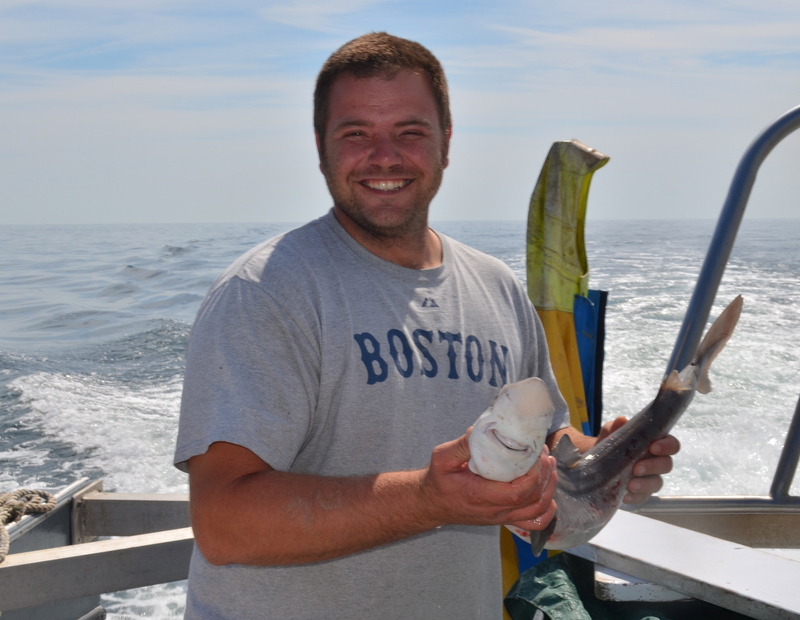 Daniel is now 28 and working on his PhD at the University of Massachusetts, Dartmouth, with the relationship between the science center and the fishermen at the heart of his research. Eric, David's oldest son, went to Boston University for air and space engineering and is currently a tugboat captain in Boston. In 2004, David Goethel was appointed the position of New England Fisheries Council Member by the secretary of commerce. 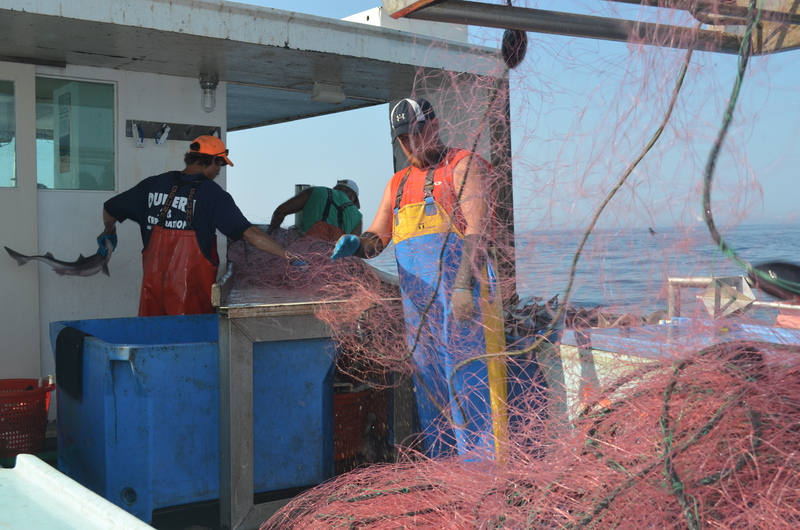 The duties of the council consist of writing the regulations for all fishermen in federal waters, 3 miles offshore and beyond, with 32 fisheries in total. Duties as a council member consist of meeting every other month for 3 days at a time, for a total of 50 days of meetings a year, which are held at various locations throughout New England. Each term is 3 years long, and one member is allowed a maximum of 3 terms. David will be finishing up his 3rd term come next August. "It's a big undertaking," he shares, "if you're doing the job you've been appointed." As a council member you are expected to have a strong understanding of the biology behind stock management and are required to be up-to-date on all the stock assessments. 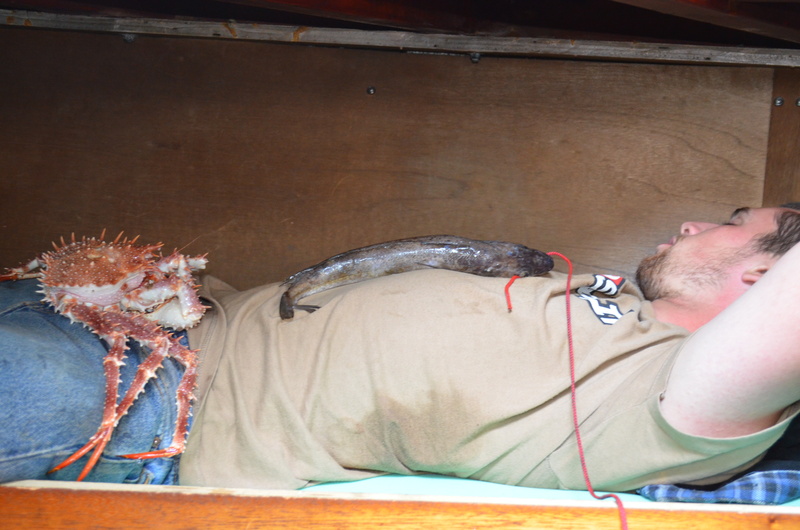 David views sustainable fisheries as a delicate relationship. "We have to have sufficient numbers of both fish and fishermen," he argues. "We need some flexibility within management; right now it's way too rigid." David brings up a quote said by John Bullard, the National Marine Fisheries new regional administrator, at the opening of the Portsmouth meeting on September 12th. Bullard paralleled the declining number of right whales to the declining number of fishermen, stating that only 400 remained of the endangered whales, compared to the 400 fishermen that remain from North Carolina to Maine. "I'll tell you what," says Goethel, "we're dropping a lot quicker than the right whales." He fears present and past regulations are to blame. "We tend to protect some animals at the expense of others. When you protect one species and exclude everything else you damage the ecosystem." He describes the increase in harbor seals as a prime example of this, suggesting there's so many these days, that they are damaging the local fish populations. David fears for the future of the industry. He believes that once a market for a species goes away, that that market can't be regained, markets such as silver hake. The market for silver hake dissolved sometime in the '60's and since then silver hake have been primarily shipped elsewhere. David also believes it's necessary to the success of the market as well as the stocks to have a diverse fleet. "You need the big boats to bring in the volume and the small boats to bring in the quality for what I like to call table cloth restaurants, high quality establishments. 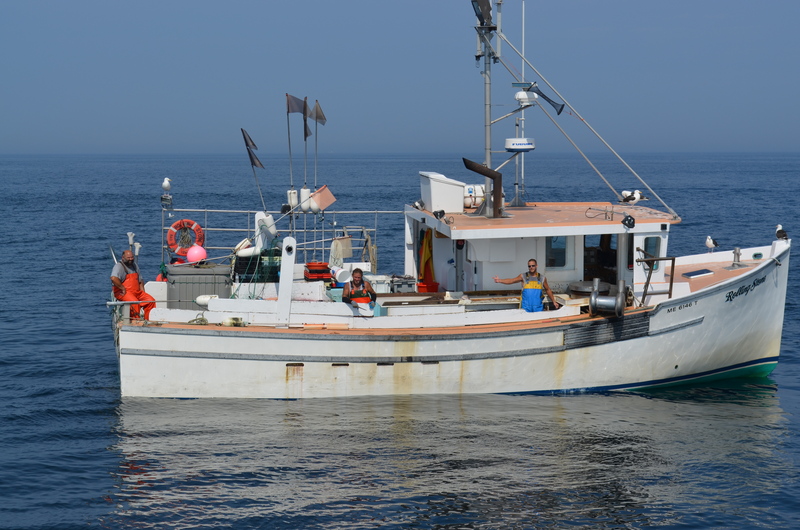 And the small boats provide fish to the seacoast every single day which help to keep the system going, maintaining the market." He pauses. "Once you put an end to those day boats you destroy the infrastructure, and you can't get it back." 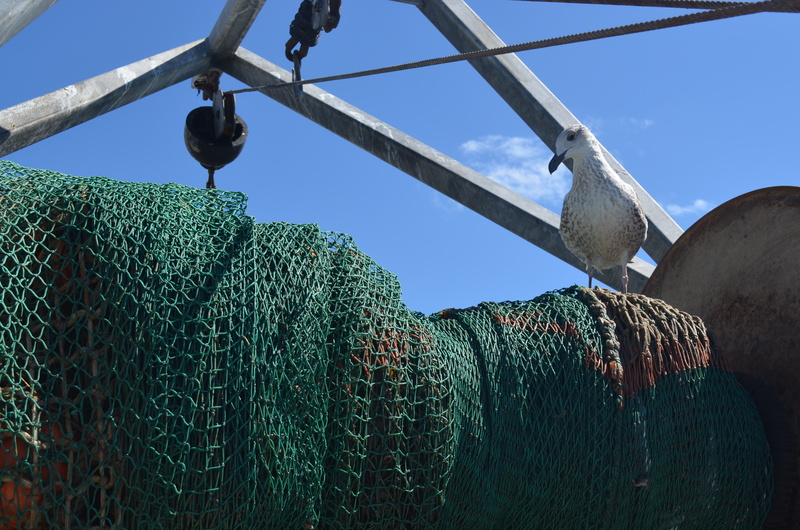 The October and November gillnetting closure lies at the heart of our conversation, for the effects of the closure are much greater than the already devastating loss of work for the fishermen. With the closure fast approaching it's hard to say the effect it will have on establishments such as the Yankee Fishermen's Cooperative. Currently there are about 15 people working there, and if there's only 5 draggers for 2 whole months, they're not going to need all those people working. "You don't need a fish coop if no one's bringing in any fish," suggests David. "If Yankee goes away, it's not coming back." When I ask David why it is he fishes, he responds, "I'm happier on the ocean than I am on the land. I get to see the sun rise every day and most days I get to see it set too. 100 years ago I guess they would have called me a naturalist. I get to see it all." After a near death experience involving a 20 foot fall onto a dock below 2 years prior to the day, for David, each day's rising sun is a blessing. He looks out over the water from the helm, and looks out back to check on his deckhand. He continues, "I’m not a specialist, but more of a generalist and because of it I have a greater understanding of the whole picture. You have to understand your interactions to your surroundings and respond to them." He believes this idea the key to effective management. David argues not all stocks can be at maximum sustainable yield. "If something’s up, something’s got to be down, and management doesn’t account for that kind of thing and because of it we’re in a lot of trouble right now. We have got to learn from our mistakes." Posted 7/8/2013 8:57am by Sarah VanHorn. “In 10 or 20 years, I think it’s going to be all over; there’s no young blood left. But you can’t think like that.” Meet Kurtis Lang, one of the youngest full-time fishermen left in New Hampshire. Having grown up lobstering with his father and having fished since the age of 10, it only made sense to him that he continued to fish into adulthood. When asked why he fishes he responds, “I just like being out here. Even a bad day is a good day when you’re on the water.” He also mentions avoiding the family landscaping business, Lang's Landscape Service, in Greenland, NH may also have been a motive as well. 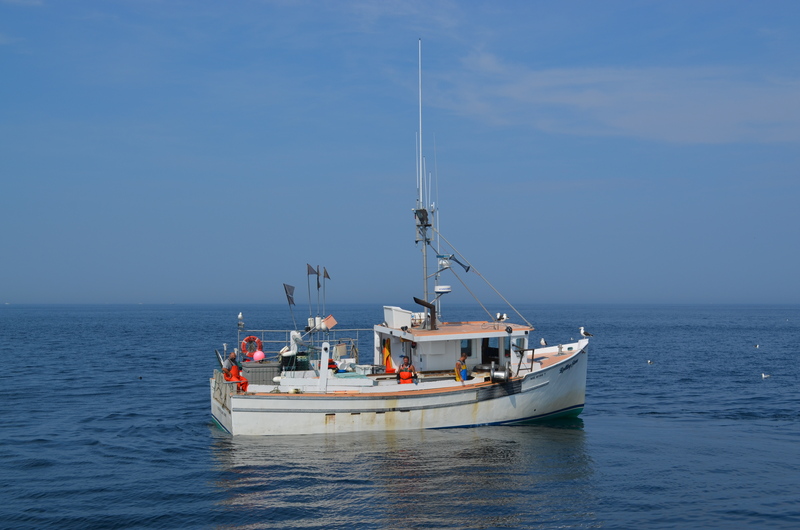 By age 20, Kurtis had a boat of his own, gill netting off the coast of New Hampshire. For the past two years now, he has been fishing off a 36 foot Novi built in 1999. 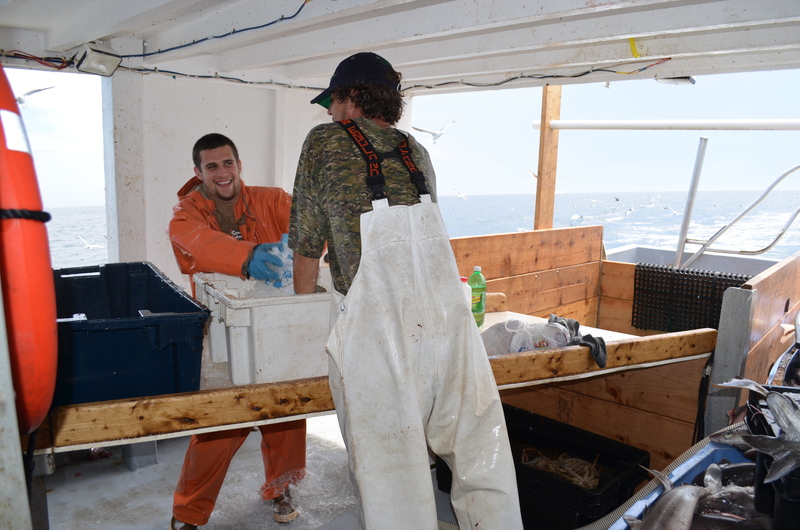 Kurtis and his two deckhands fish 7 days a week with a few days off in October, a time when he typically switches over to lobstering to make up for the lack of fish allocated to him that time of year. 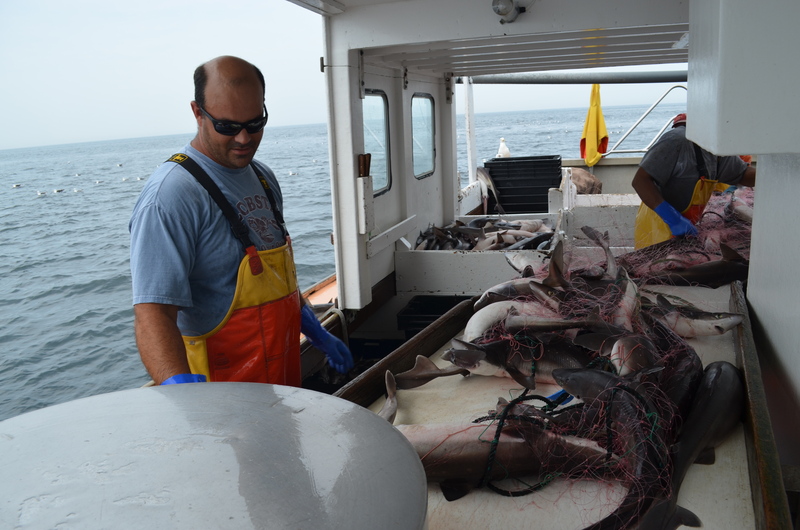 Currently, while the dogfish sharks are plentiful through the end of August, a good day is described as catching 3,000 lbs. 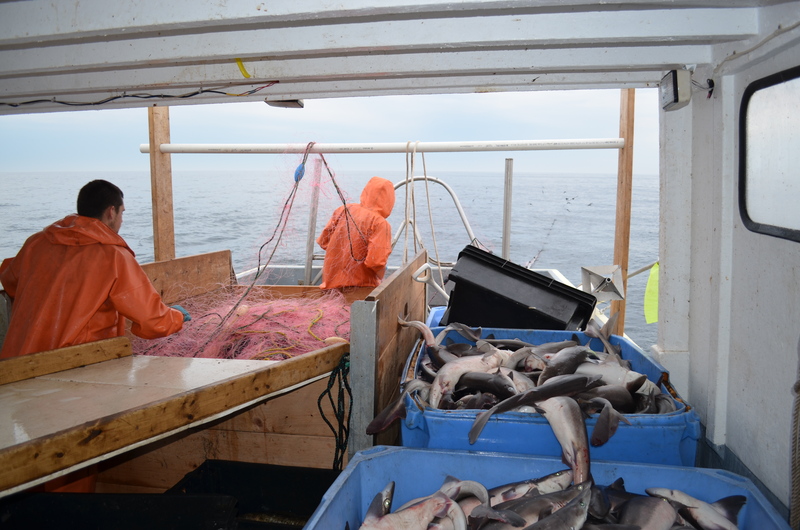 of dogfish and about 10 boxes full of fish, such as cod, pollock, sole, and monkfish. Though Kurtis agrees it is important to establish a fishery that is able to sustain itself, he argues it's hard to really predict what's in the water, and thus certain regulations aren't always appropriate. "Came out here yesterday," he says, "there were no fish, just dogs. And it would make you think that there's no fish, but things are always changing. It's a big ocean, and there are lots of factors affecting the changes: tides, migration patterns, water temperatures, spawning. There's never just one factor." He later shares he pulled in over 8,000 lbs. of dogfish just the day before and very few fish, a dreaded day for any NH fishermen, considering the price for a pound of dogfish is typically around half a dollar, not to mention he's only technically allowed to land 3,000 lbs. 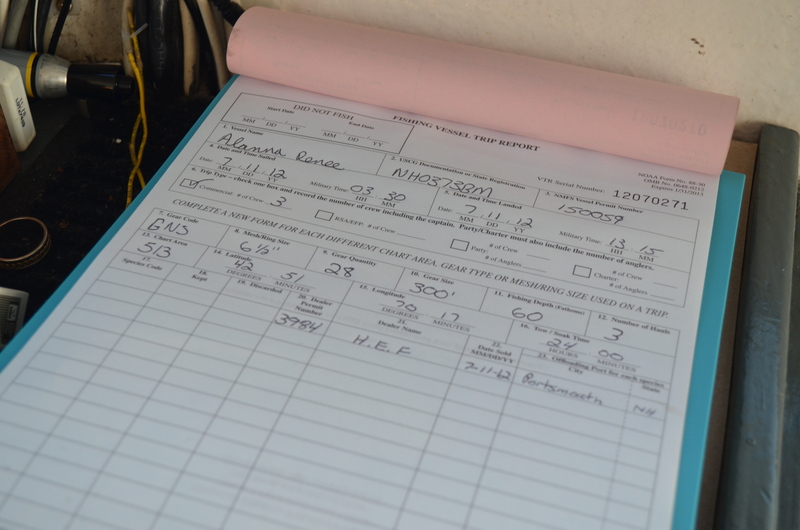 a day as prescribed by set quotas. He worries that the continual increase in fishing regulations is going to put more local fishermen out of business if the regulations don't scare them away first. Piles of paperwork, emails, and phone calls, on top of fishing a full day, is common place for today's fishermen. "In some cases, it's making people not want to fish," he claims. With the growing concern for the Atlantic cod populations, he fears what regulations will come next. 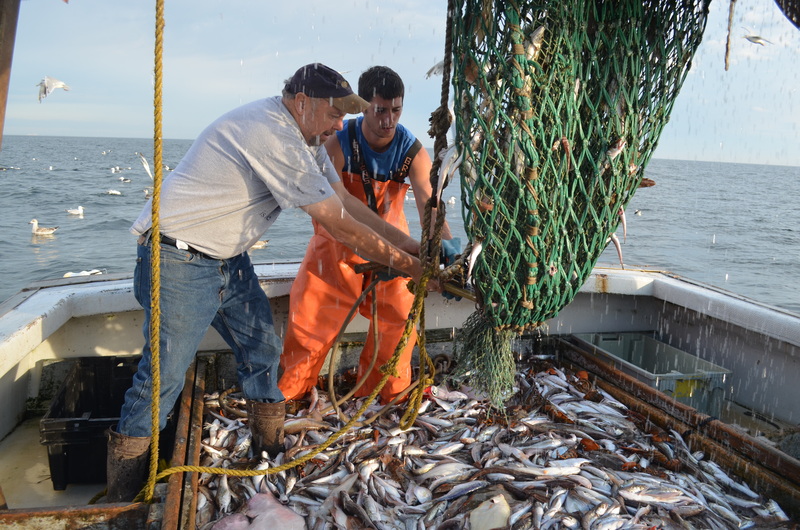 "If they cut the quota for cod fish anymore, I don't see how most of us could continue." After all, fish is where the money lies. When asked about local seafood in relation to the general public, he states, "It's good to have local interest in seafood because people don't always know what's in our water here, and people don't know what we go through as fishermen, to catch fish. I think more people would buy fresh fish if they knew more about it." "Buy fresh fish. You'll be amazed at how much better it tastes." Kurtis resides in Portsmouth, New Hampshire with his wife and his two daughters, Sydney, 3, and Riley, 1. Posted 6/29/2013 11:37am by Sarah VanHorn. “In the old days you'd come out, work hard, and make money; but in the old days there weren't any restrictions," reflects fisherman Rick Anderson a resident of the same house in Rye, New Hampshire for the past 40 years. When Rick's father was first stationed in the seacoast area, Rick was 9 years old. He spent the remainder of his childhood living in Dover, New Hampshire and as a young adult found work lobstering with a guy down in Gloucester, Massachusetts where he commuted from his Dover home. It wasn't long before Rick had a few traps of his own, and at age 23 had saved up enough money to have his own boat built. “Boats were cheap back then; only $10,000 for a boat,” shares Rick. 4 years later, in 1972 Rick switched over to gillnetting, and in 1983 to dragging, and in 1992 back to gillnetting and has been doing it ever since. Fishing being the only thing Rick's ever done for work, today he fishes off of a 1997, 44 foot Novi he had built for himself by McGray Boatbuilders, in Cape Sable Island, Nova Scotia. “I fish because I enjoy it. It's a good way to make a living, doing what you enjoy," proudly shares Rick. Bridget Leigh leaves Rye Harbor at 3:00 am 7 days a week, heading 18 to 25 miles offshore, depending on where they set their strings the day before. 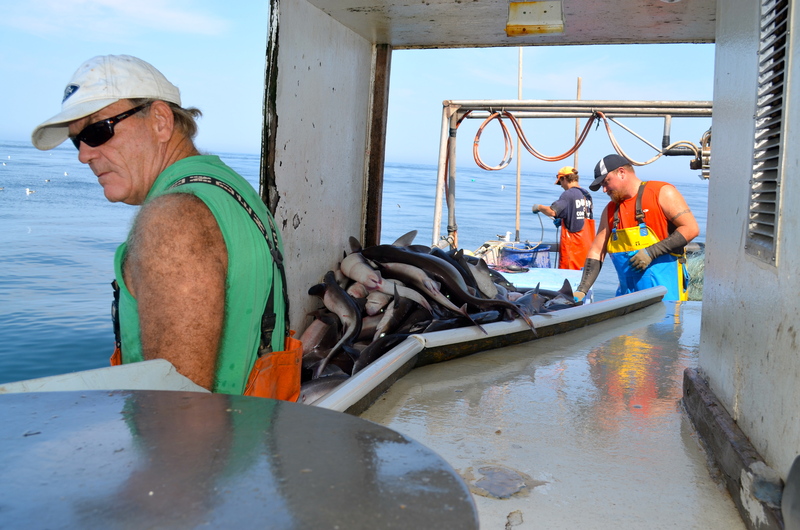 Rick describes a good day fishing to be when they are able to make a bit of money for the day, with the aim of catching around a thousand pounds of groundfish and a couple thousand pounds of dogfish shark, which can fluctuate. To maintain his fishing operation as a whole he needs to pull in a total of 1,500-2,000 pounds a day. 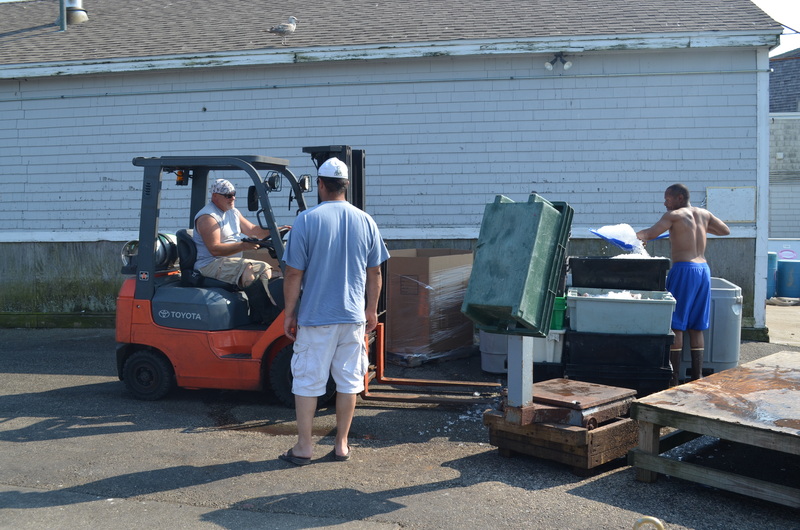 At the end of each work day, his catch is offloaded at Rye Harbor, and shipped to the Yankee Fishermen's Cooperative in Seabrook, New Hampshire. Rick and his wife, an elementary school aid, spend their winters, November through February at their home in Marathon Keys, where Rick spends his time fishing recreationally, as well as tending to his extensive flower gardens. Having been in the industry for so long, Rick doesn't understand how anyone new could ever get started. “There's no way anyone can get into this business anymore. It's just not feasible; with this quota system, there's no way you can get any [quota] because it's already given out. Everything costs more these days." Because no new blood is able to join the fleet, on top of the ever increasing amount of government regulations, Rick fears for the future of the fishing industry. 5 years down the road, he predicts the local fishing industry will be controlled by a few good boats, with only 1/3 of the entire New England fleet remaining. 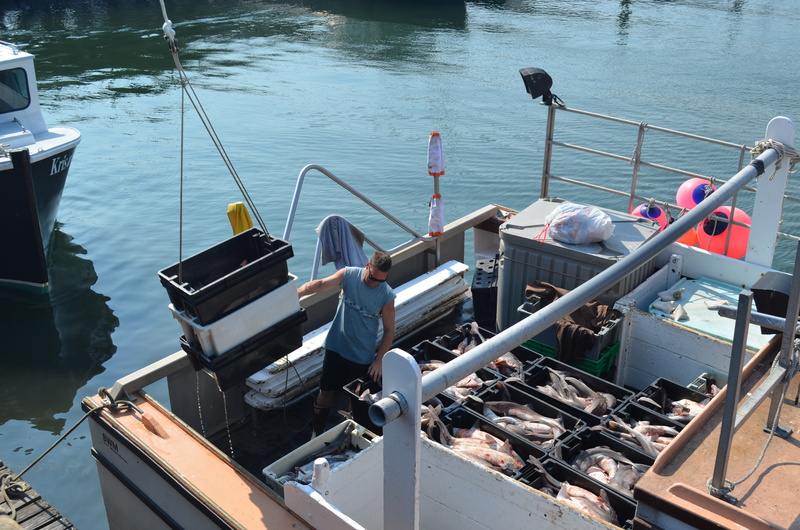 He fears it won't be long before the fishing will be left to about 100 boats for all of New England's coast, with only 2 or 3 boats in NH, forced to fish part time, compared to the approximate 40 groundfishermen within the granite state. It's a grim future, to say the least. "These days, people just don't stand a chance; they really don't." Resetting the net using a "Flaker"
"Buy Local. We got fish. It's all fresh and it's well taken care of. All we have is fish of the day, the best kind, and it hasn't been sitting on a boat for a week." Posted 6/24/2013 11:40am by Sarah VanHorn. "The only reason I'm still here is because I'm good at it. If I wasn't good, I would have been gone a long time ago,” says Jamie Hayward as we head out to sea in the early hours of the morning. 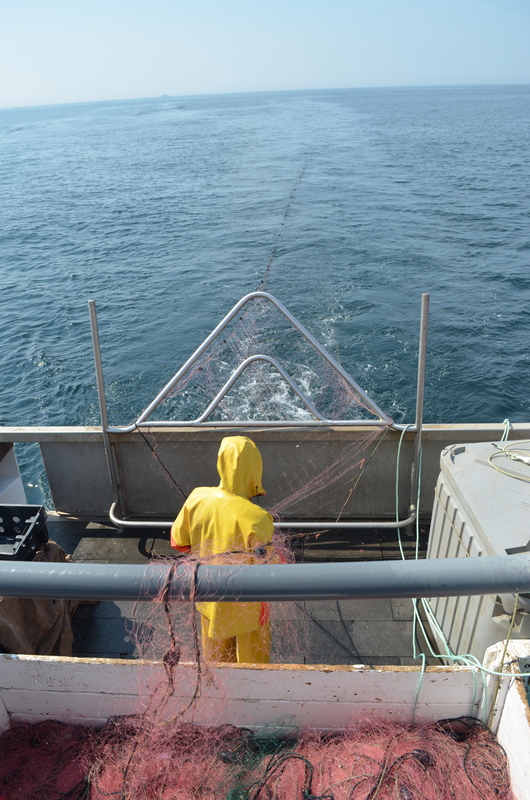 Jamie has been fishing for the past 25 years and gill netting for the past 20 years. Today he fishes off a Novi that his father had built for himself in 2000 by McGray Boat Builders LTD, Cape Island, Nova Scotia. 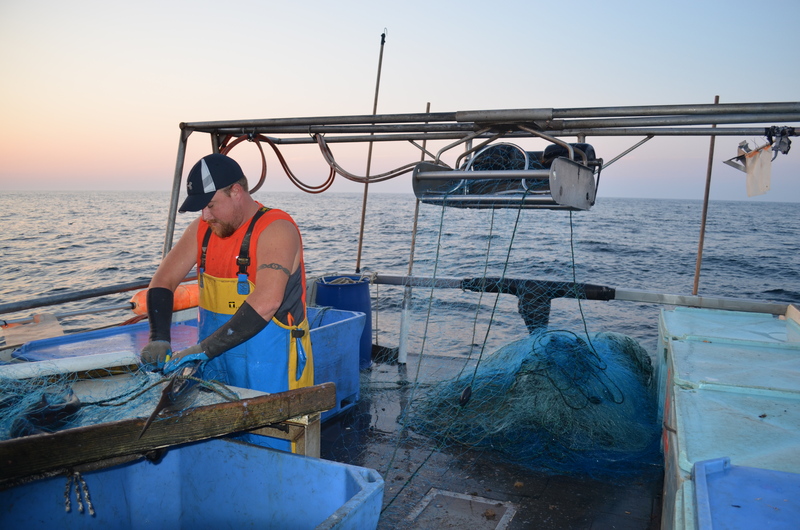 Jamie grew up gill netting with his father, but when his father switched over to lobstering, Jamie bought his boat in 2004, and hired a crew to operate his previous boat, the Rolling Stone which also operates out of Badgers Island. His crew jokes, and suggests his nickname is, King Cod. Jamie smiles, and shrugs them off. "We have a finely tuned machine here," he responds when asked about his success as a fishermen. Targeting dogfish, monkfish, cod, and pollock, Jamie is well-known by other fishermen for fishing up and down the edge of a 900 square mile section closed off to all fishermen just over 20 miles out to sea. A closed section can serve different functions, but more often than not, they serve as a refuge for different species, helping to maintain their populations. Jamie describes a good day fishing as when he can sell everything that comes up in his net. "A good day fishing? Westbound is a good day fishing; when we're able to go out, fish, and come back. Any day when we don't get over dogged really." 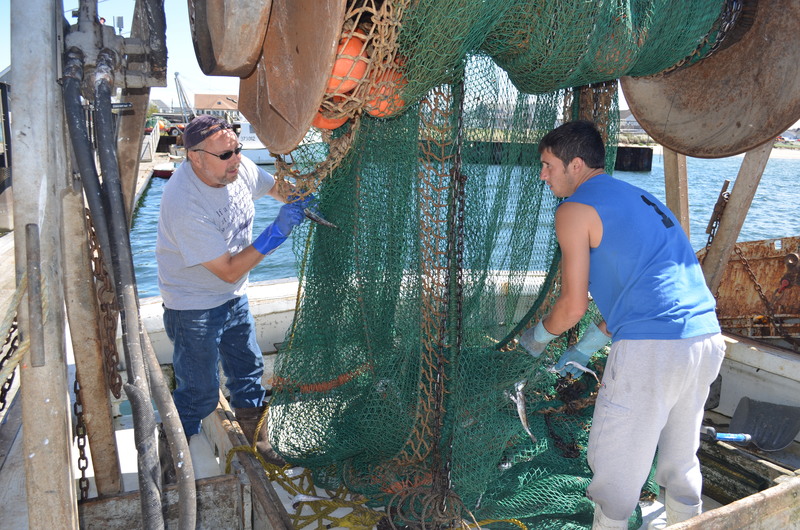 Over dogged, an issue many NH fishermen have been dealing with the past couple of weeks. 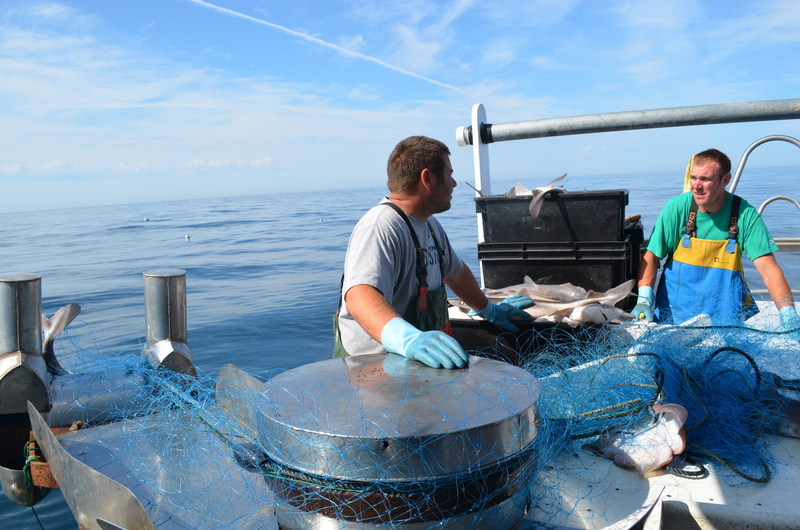 NH fishermen are only allocated 3,000 pounds of dogfish a day due to regulations assigned by management, but as of lately dogfish shark have been hard to avoid, and many have been pulling in a great deal over their allocated quota and very few fish since the dogfish and the more valuable species, like Atlantic cod, don't always coincide. "Today, slightly cloudy with a chance of dogs," suggests Tommy, Jamie's deckhand, a man who has been in the business 30 years himself. When asked what a sustainable fishery means, Jamie responds, "To maintain a certain amount of fish. It's just a scientific term that says fish will be here forever as long as the government maintains a certain level of regulations." When asked about a sustainable fishery in NH he replies, "It's already sustainable, it's not being overfished, but the annual catch limit is based on science and that changes all the time.” He pauses, gazing out to the open water, "The government's in control now, you can't blame the fishermen anymore." He pauses, and one of his deckhands jokingly fills in, "Don't hate the player, hate the game." There are laughs all around. Jamie is a big fan of the New England Patriots and goes to their games any chance he gets. When I ask if he has any other hobbies, he responds, "Maintenance." I look confused, and he clarifies. Maintenance: mowing the lawn, doing the laundry, working on the boat, etc. "We fish 13 hours a day, 7 days a week. That's all we have time to do." "Then why do you do it," I ask. "If I had any kids, I would say I fished to feed my kids, but it's really just a means to make a living. It's not really fun anymore," says Jamie Hayward of Eliot, Maine. There's mention of fishing not being what it used to be, and of regulations creating new challenges each year in regards to their ability to make a living. For many fishermen, it's the only way of life they have ever known. 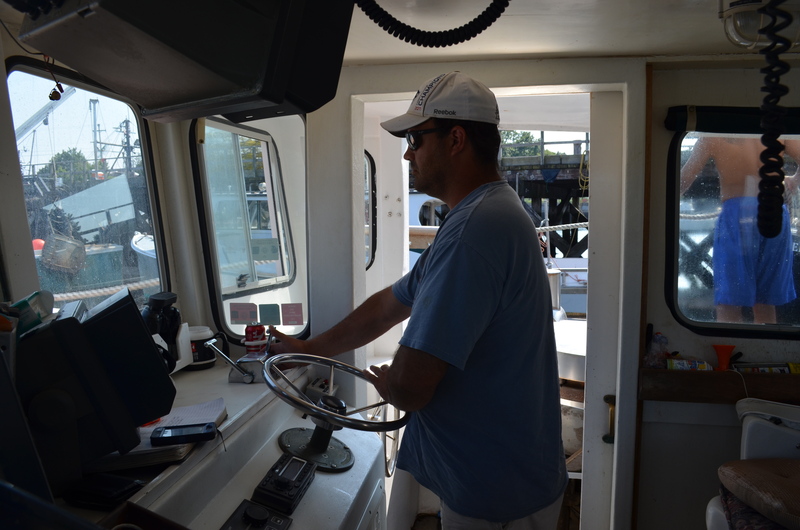 He looks over his shoulder from his seat at the helm to his crew filleting fish on the open deck. "I fish to give these guys jobs." Visit Seaport Fish to buy Jamie Hayward's catch of the day. 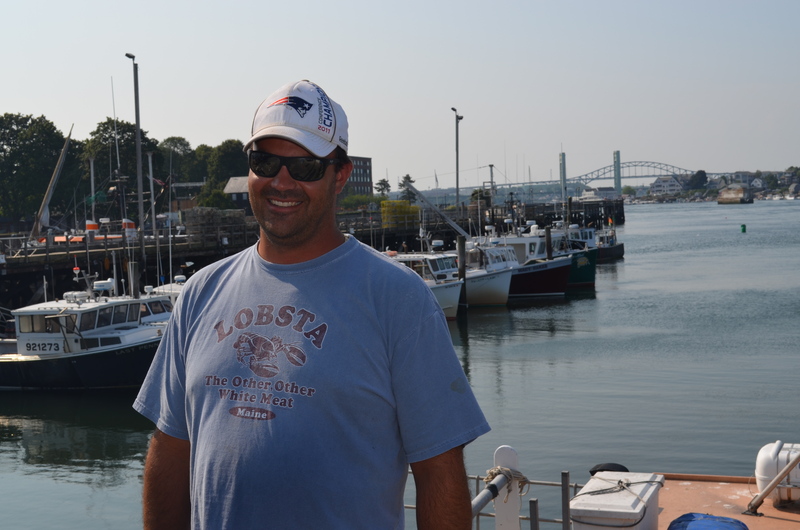 Support him and his crew, as well as the future of a Sustainable New Hampshire Fishery. No CSF Pick-Up JULY 4th!!! Posted 6/21/2013 3:04pm by Andrea Tomlinson. Due to the holiday, there will be no CSF pick-up on Thursday, July 4th. Your share of fish will be available Wednesday, July 3rd instead, at the same place, same time from 4:00-7:00 pm. If you are unable to make this pick-up due to the change in the schedule please contact us immediately and we will do our best to accommodate you.